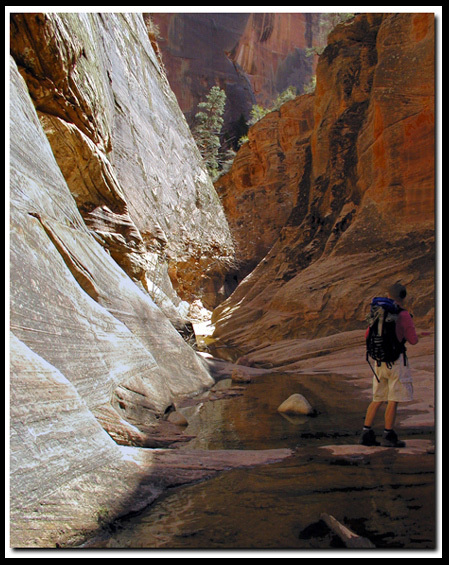 Backpacking in Zion National Park can be found in all three major sections of the park: Zion-Mt. Carmel Highway, Zion Canyon and the Kolob areas. All backpacking trips and technical hikes in Zion require a permit. For most of the backcountry trails there are no designated camp sights. Choose your site so that it is not visible from the trail and leave no trace of your stay. Camping is not allowed within .25 miles of a spring. Plan your trips so the difficult sections of the trail are during the cooler times of the day. Be sure to bring plenty of water or a means to treat it. Choose gear that allows you to carry all the essentials and is still compact and light. Today's tents, sleeping bags, backpacks and other gear are usually made with this in mind. East Rim Backpack - The East Rim is a leisurely backpack that begins on the east side of the park and ends in Zion Canyon. It can be combined with Cable Mountain, and Deertrap Mountain. It is best done with a shuttle, dropping hikers off at the trailhead near the parks East Entrance booth, then ending in Zion Canyon. The grade is less steep, and the view hiking in that direction are unsurpassed. Without a shuttle, begin in the canyon, hike to a camping area, then return the way you came. Deertrap Mountain - Hike up the East Rim Trail and take the spur to Deertrap Mountain. Stave Springs is the usual camping spot for the East Rim, Deertrap and Cable Mountain Trails. The view from the top of Deertrap Mountain is incredible! Cable Mountain - Begin this route at the East Rim Trailhead and hike up the dirt trail. Take the junction leading to Cable Mountain. West Rim Backpack - It's idea to do this hike with a shuttle. Begin at Lava Point, hike mostly downhill into Zion Canyon. Without a shuttle, begin in Zion Canyon, hiking to a camping area, then return the way you came. Parunuweap - This trip to the East Fork of the Virgin River is only for experienced wilderness backpackers. Hike from Checkerboard Mesa, over slickrock before dropping down into the river near the Powell Plaque. The Plaque reads: "Major John Wesley Powell 1834-1902 explorer, scientist, Steven V. Jones 1840-1920 teacher, topographer, Joseph W. Young 1829-1873 Mormon pioneer leader, descended Labyrinth Falls 1/2 mile below Monday, September 30, 1872 during first Parunuweap Canyon traverse. Powell named this canyon from the Paiute Indian word 'Parunuweap' which means roaring water canyon. Dedicated September 30, 1972." Backcountry Permits: are required for all overnight and technical hikes or canyons. Zion Narrows Backpack - The Zion Narrows begins outside the park, in East Zion at Chamberlains Ranch and ends at the Temple of Sinawava in Zion Canyon. Arrange a commercial shuttle service to be dropped off at the ranch or use two vehicles. The road to the ranch requires a 4WD. Permits are limited and there are only 12 campsites. Check for flash flood conditions before hiking the narrows. The Kolob Arch Trail is 14 miles long and can be done as an overnight backpack or a rushed one day hike. The path leads to the world's longest free standing arch. The arch is a cliff wall arch, set in an alcove at the end of the trail. The 14 mile West Rim Backpack begins at Lava point and ends in Zion Canyon. The trail is a narrow forested path for the first 9 miles and then drops into Zion Canyon for the last 5 miles. Along this last section is a side trip to the incredible Angels Landing trail. Private vehicles can travel SR-9, from Zion's south entrance, out the east entrance (or visa versa) to the junction of SR-9 & US-89 year-round, 24 hours a day. See tunnel restrictions for Oversized Vehicles. The only summer access to the Zion Canyon Scenic Drive is via Zion's shuttle. During the winter private vehicles can travel in the canyon. Exact dates the shuttle runs may vary. Zion National Park is a land of famous monoliths including towering Angels Landing, one of the parks greatest hikes, Great White Throne, Cathedral Mountain, the Organ which is seen best from Observation Point, East Temple, Checkerboard Mesa, West Temple, Temple of Sacrifice, Twin Brothers, Beehives, Sundial, Court of the Patriarchs, Mount. Spry, Mount Kinesava, Kolob Arch, the Guardian, Streaked Wall, the Sentinel, the Watchman, Towers of the Virgin, Mountain of the Sun, the Zion Narrows, the most famous hike in Utah, and Cable Mountain, just t name a few.